With the Formula One season drawing to a close next weekend with the Abu Dhabi Grand Prix, read a recap of this fall’s grand prix season and catch race highlights. Hosted at the legendary Autodromo Nazionale Monza, this year’s Italian Grand Prix saw Lewis Hamilton taking an early lead and ultimately finishing in first place. Mercedes teammate Valtteri Bottas clinched second place, bringing Mercedes their third one-two finish of the season. Sebastian Vettel and Ferrari finished in third place, relinquishing his leadership position on the table. Lewis Hamilton lengthened his lead over rival Sebastian Vettel in Austin despite an initial challenge from the German in the first laps of the race. Hamilton quickly recovered and continued on to take first place on his favorite track, relegating Vettel to second place as Hamilton held a sixty-six point lead on the championship table. While Vettel was mathematically unable to take table victory this year after Mexico’s Grand Prix results, that didn’t stop the German from finding victory in Brazil this year, taking the top place for Ferrari in a feat unseen for ten years. Rival Lewis Hamilton had a rocky start from the pits, missing the podium but making up sixteen places to take fourth. Looking forward to the upcoming Abu Dhabi Grand Prix at Yas Marina? 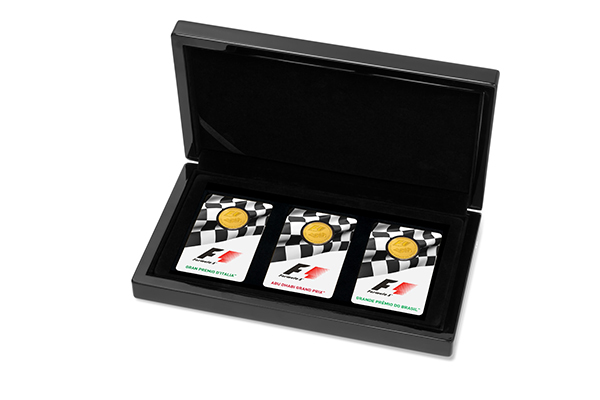 Find exclusive commemorative coins celebrating the race only at Rosland Capital.